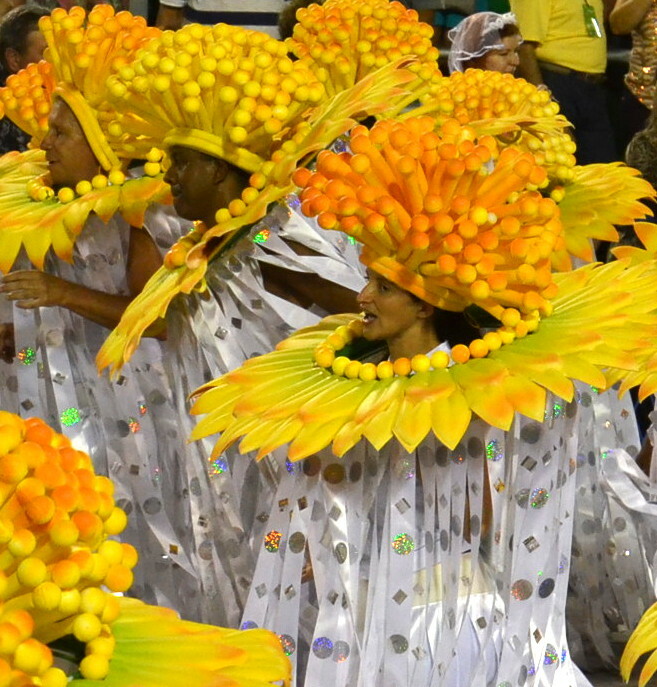 Groups of dancing and singing people dressed as lions, giraffes, eagles, cars, dolphins, flowers, leopards, African tribal people, and scantily-clad women strutted in unison one after the other to drum beats and the clock, with each group featuring a different color and design that coordinated with the theme of their school float. 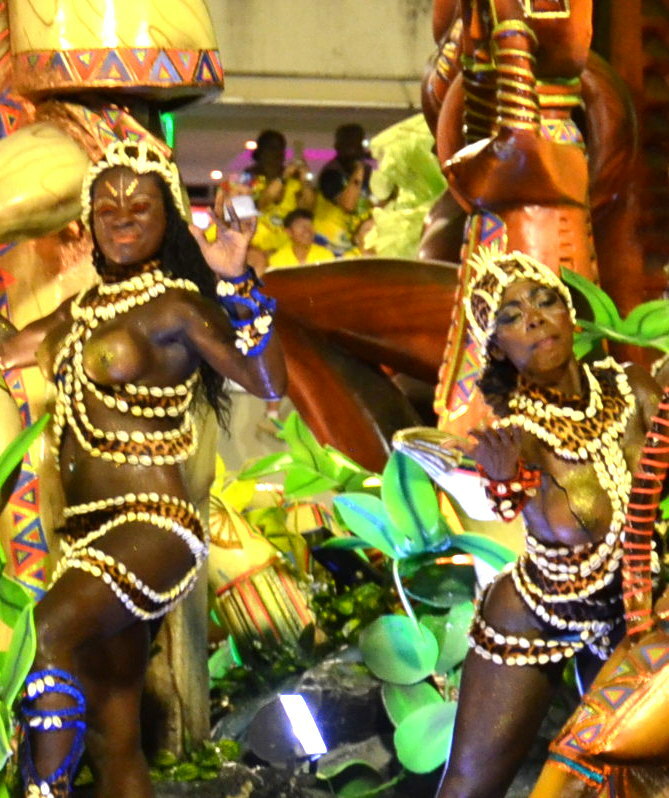 1 of 8 Beija-Flor floats at Carnival in Rio depicting the African roots of Carnaval in Rio. Our group was called the Beija-Flor group on the Tauck Events tour. 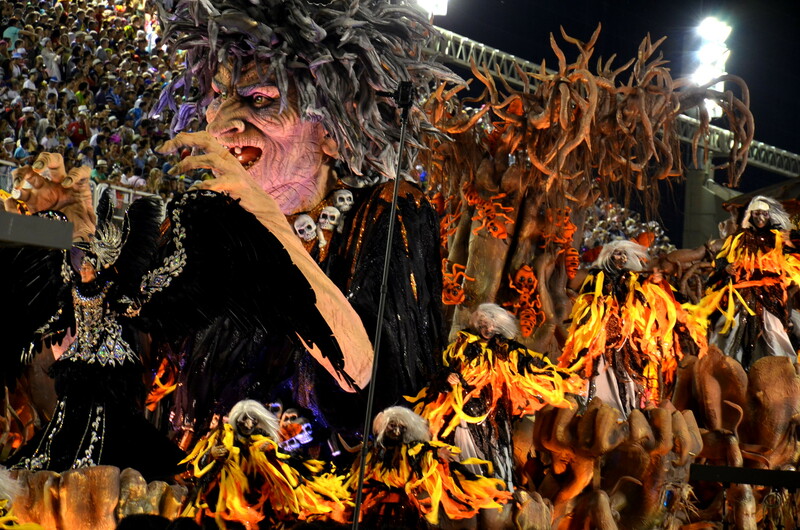 Photo by the Rio de Janeiro News Media. 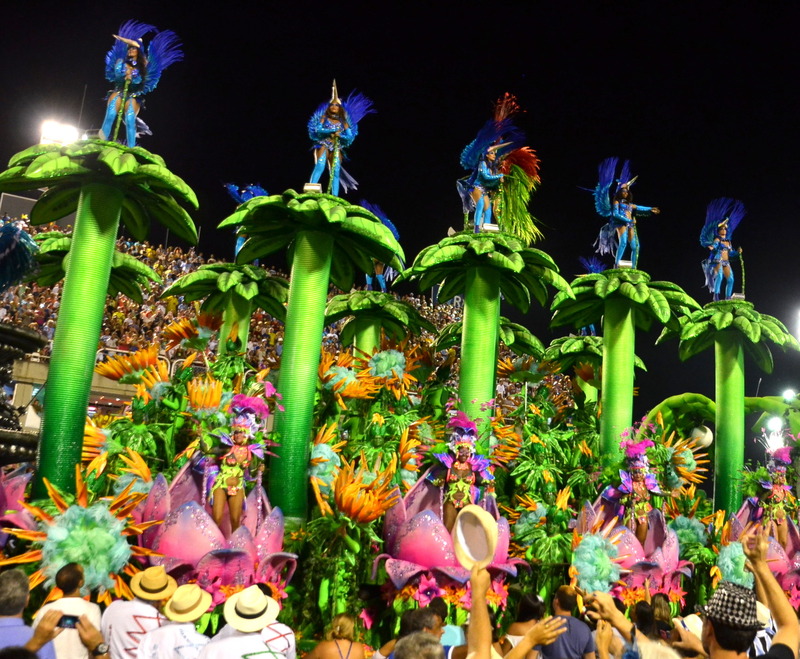 This was Carnaval (Carnival in English) in Rio de Janeiro, Brazil, the largest and greatest carnival in the world, where 2 million people celebrate, eat, drink, and party to the max for four days before Ash Wednesday. On this day, many Christians sacrifice for 40 days in preparation for Easter by observing a period of fasting, repentance and moderations, and spiritual discipline. Sitting in our “Frisas” Front Box seats with the Tauck Events (ww.tauck.com) group around 9:30pm, we could clearly see the 15,000 celebrating people pulsating in rhythm side by side like marching soldiers. 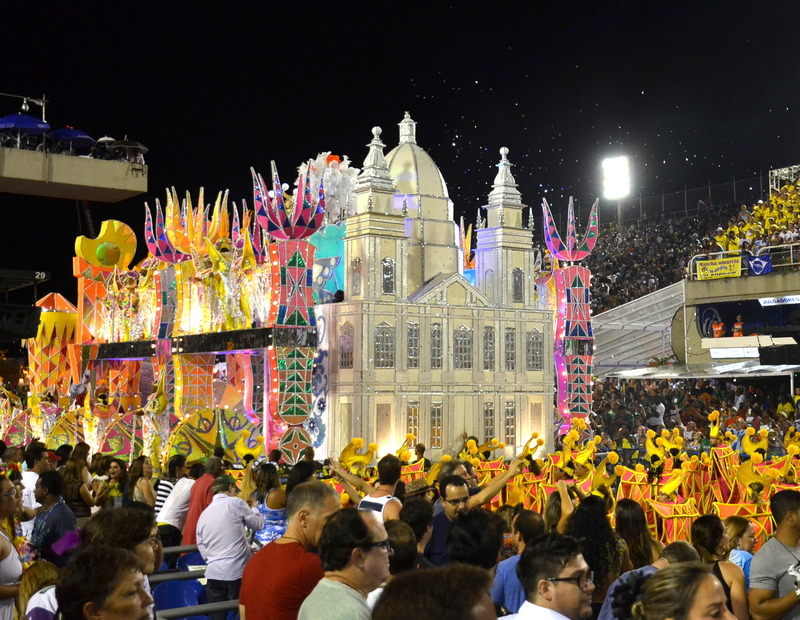 Passing by us were the schools of Sao Clemente, Portela and Beija-Flor. We were amazed at the fierce competition among schools for the Grand Prize. At 2 am, we decided it was time to leave without seeing the other 15,000 participants in 3 more schools that paraded until 6 AM. 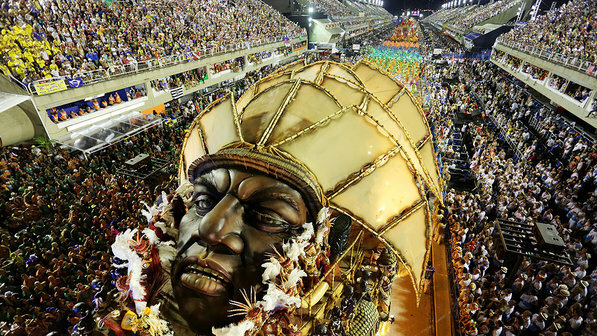 The Carnaval parade was in the Sambadrome designed by world renowned architect Oscar Niemeyer. 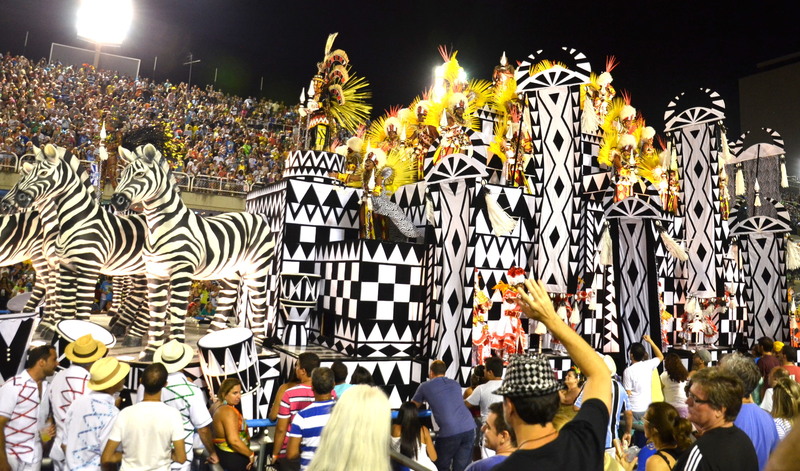 It was purpose built in 1984 in the middle of Rio de Janeiro exclusively for the parade. 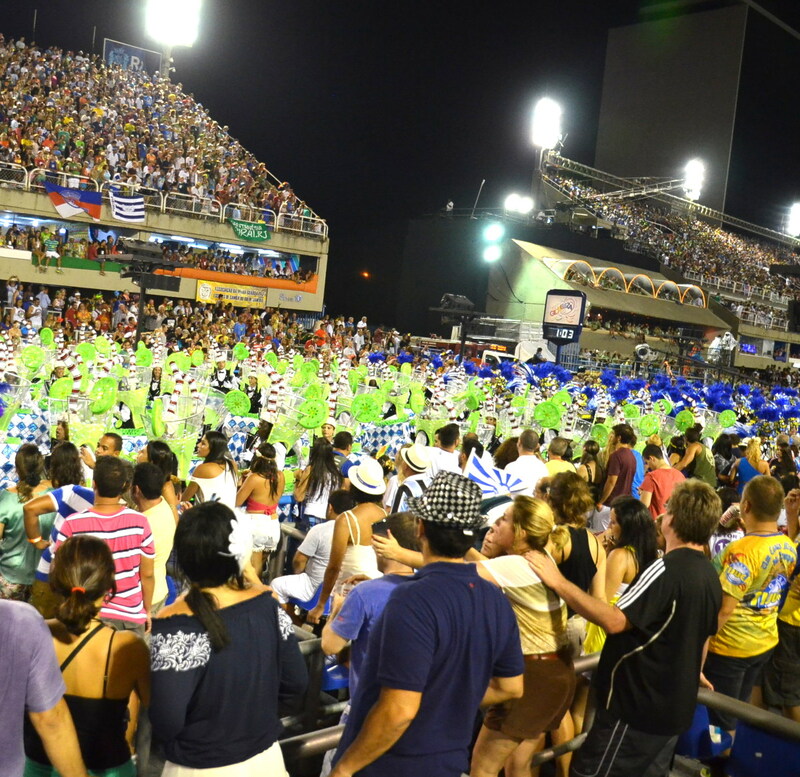 The stadium was renovated and completed in 2015 to increase seating capacity and acoustics for the 2016 Olympics. 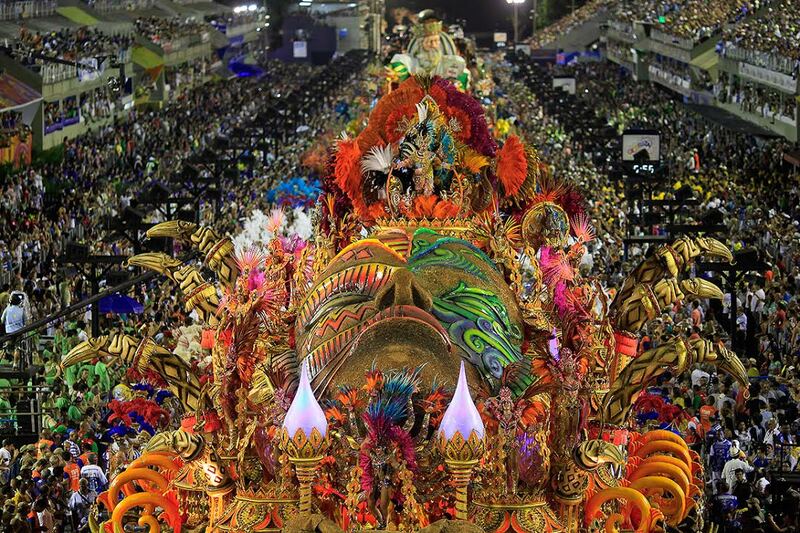 Around 90,000 spectators with seats on each side of the ½ mile long (700 meters) by 42 foot (11 meters) wide runway/street can view the carnival perfectly. 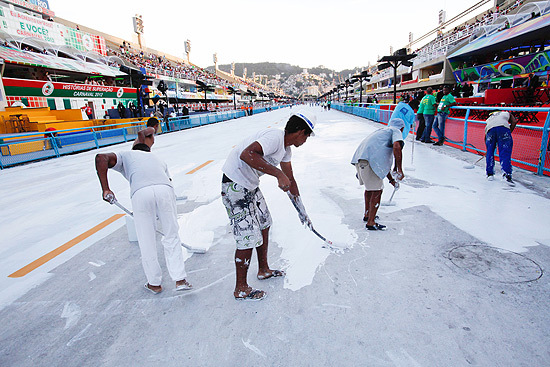 Each year before the parade, the street is painted white because the Sambadrome parade floor has to be spotless and painted white to reflect the light and to improve the TV broadcasting images. 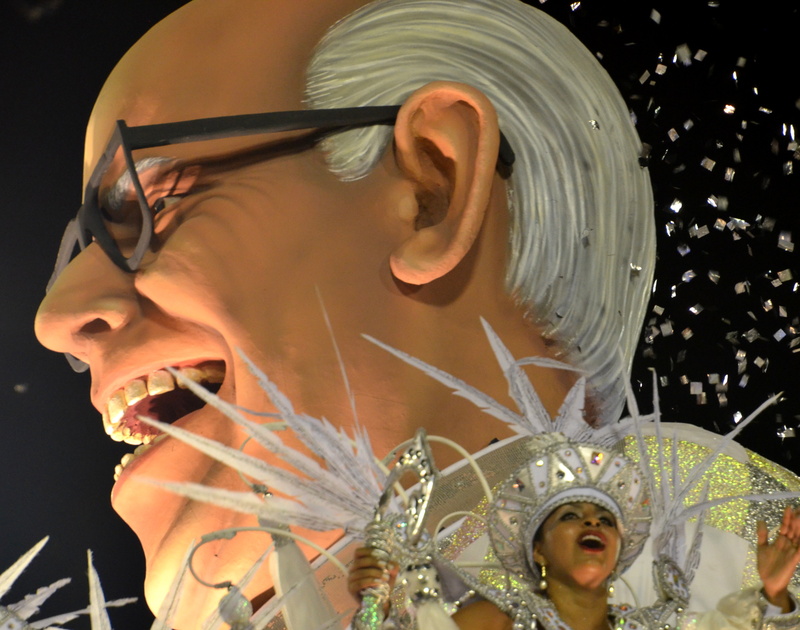 Smiling Renato, caught in his Broom Samba Dance, by the Rio de Janeiro News Media. 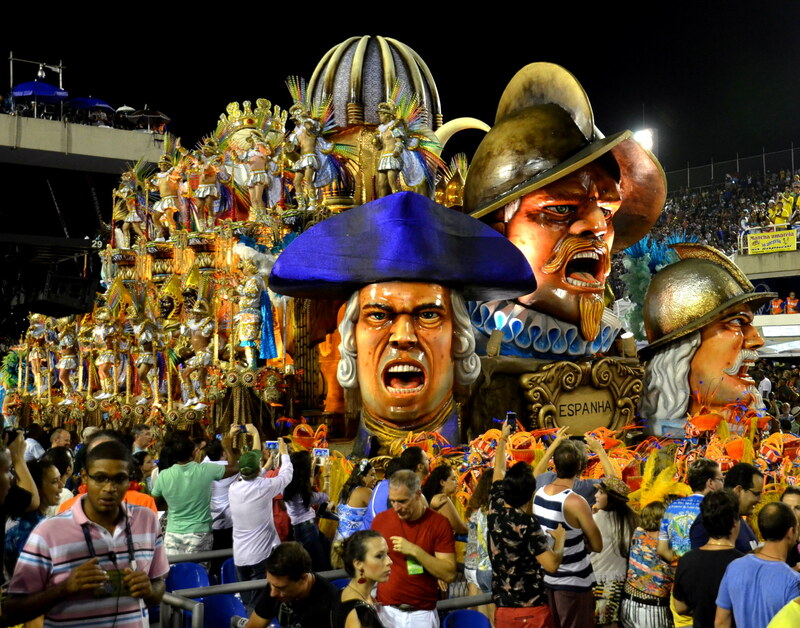 Phot0 by the Rio de Janeiro News Media. 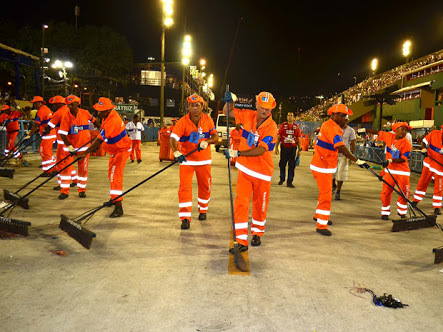 In 1997, Renato Sorriso nicknamed Smiley Renato, and his Rio city cleaning crew was cleaning the Sambadrome runway between school performances when he started dancing samba with his broom. The Garis or cleaning crew sweep after each school’s presentation for debris on the runway. Photo by the Rio de Janeiro News Media. 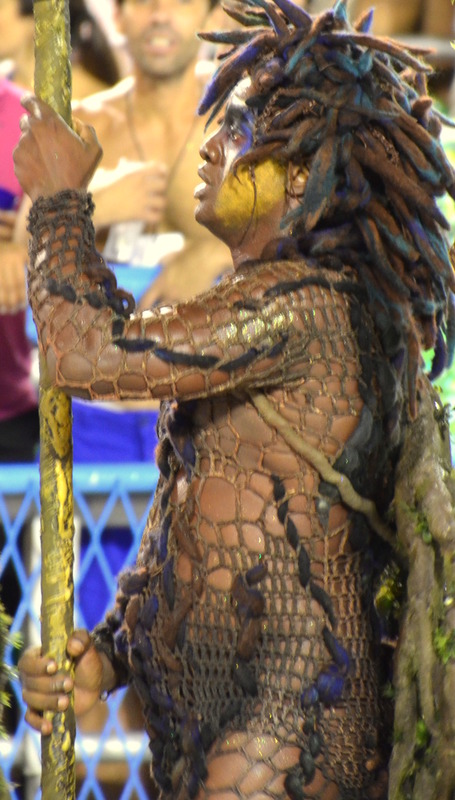 The crowd went crazy and he’s being doing it ever since becoming an attraction during the parade himself. 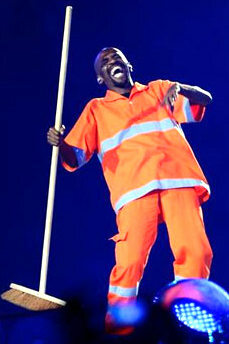 He became so famous with his dancing that he was invited to the London Olympics closing ceremonies dressed in his cleaning outfit representing Rio de Janeiro’s 2016 Olympics. 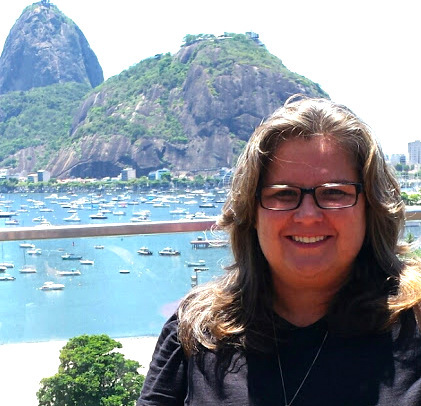 Sonia Lima, our fun, outstanding and expert Rio city guide on our Tauck Events tour, with Rio’s Sugar Loaf Mountain and Bay. 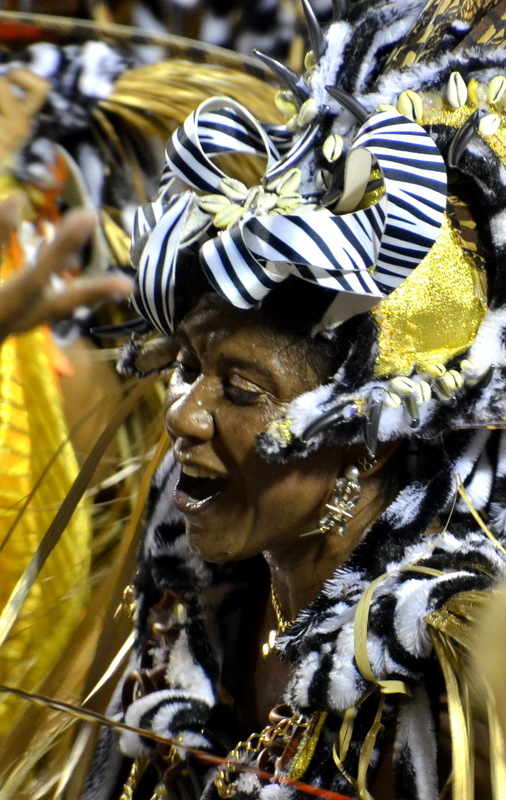 “Carnival is feeling the music inside of you and moving your body anyway you wish,” Sonia Lima, our Tauck Carnival guide in Rio demonstrated as she moved her body to the music. 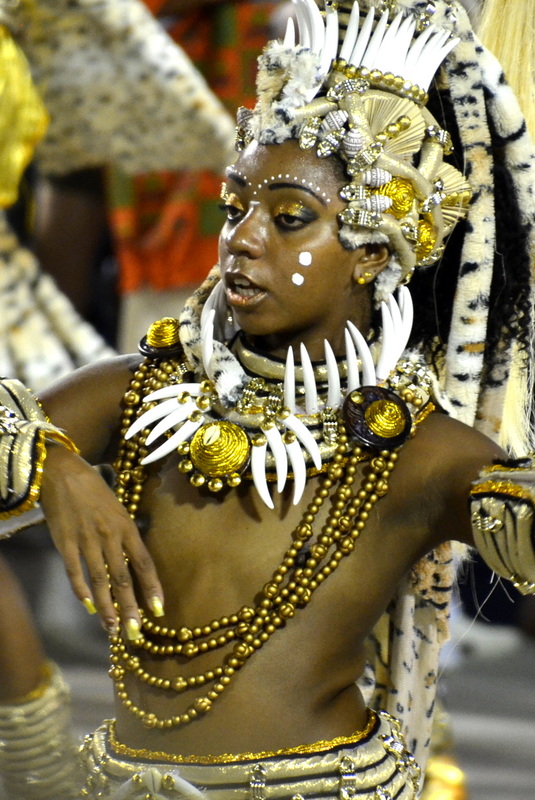 “Carnival began in 1920 when the African people living up the hills came down in costumes playing drums and dancing the samba. Then in 1935, parading in the streets began. 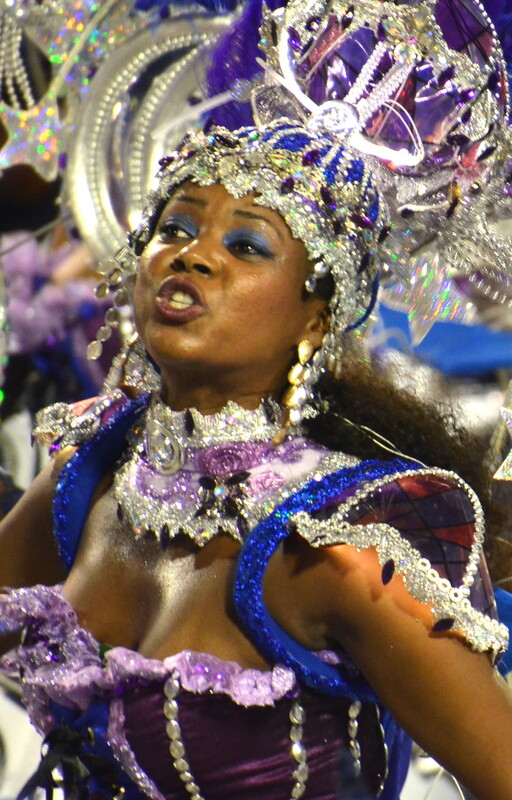 We have been celebrating Carnival ever since and this was how different schools started with groups of friends,” Sonia explained. 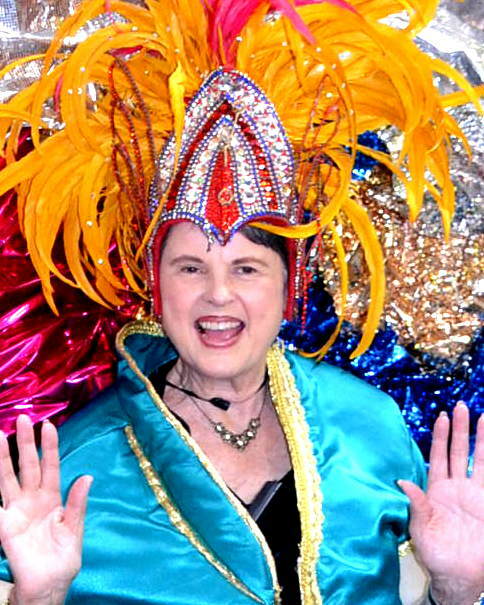 To prepare for this Tauck Event (www.tauck.com), we all were offered samba lessons and then went to a samba school to see their costumes, floats and drums. 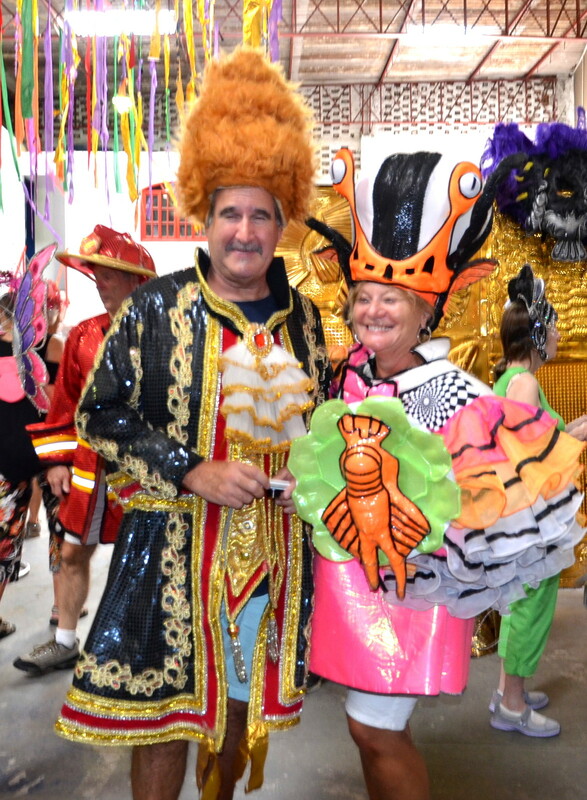 To our surprise, we learned firsthand what it was like to be a Carnival participant as we tried on last year’s costumes. Suddenly we became anything we wanted to be as we selected from the many costumes. The bateria percussion drummer band keeps the beat going for 80 minutes non-stop for their school. 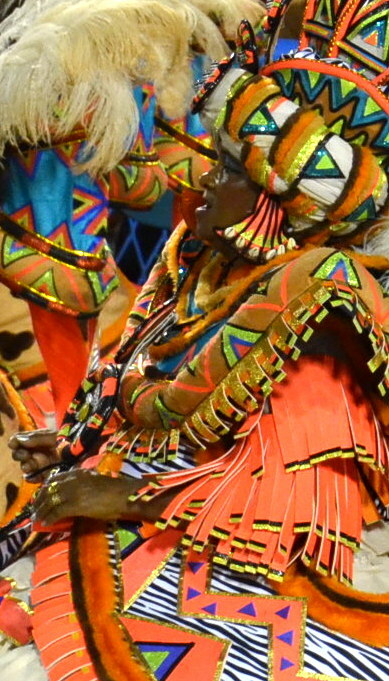 Amazed at how heavy the head pieces, dresses, jackets or drums were, we tried to image walking several hours from 9 PM to 6 AM in less than 80 minutes in the heat wearing or carrying them without passing out. 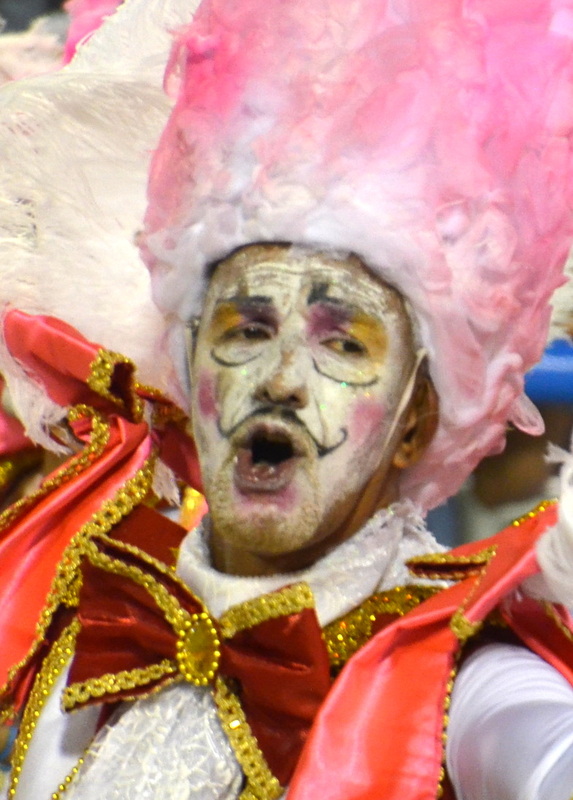 There are over 75 samba schools that participate in Carnival each year in Rio, but the Elite Special Group of 12 schools is the one that performs on the Sunday and Monday before Lent-Ash Wednesday. 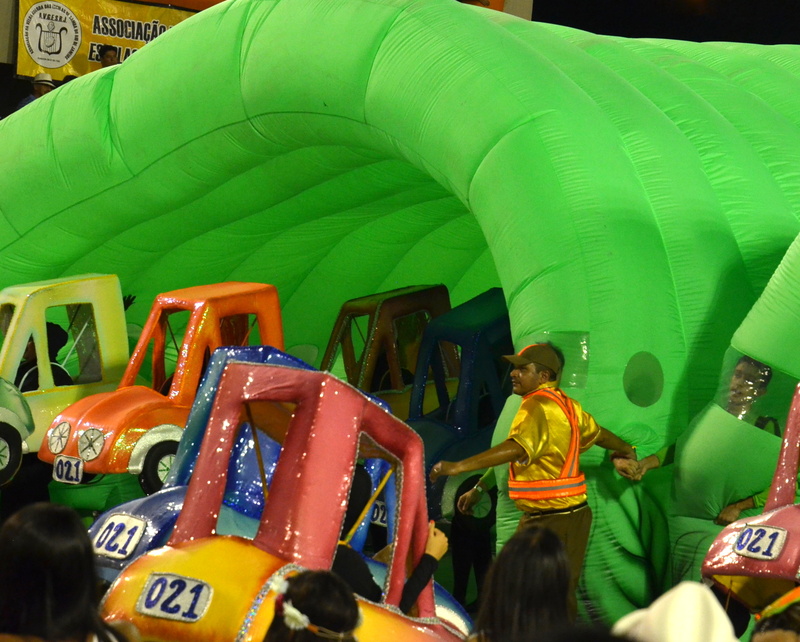 Six schools participate in the parade on each day and we attended the Monday parade which often has the winner of the competition each year. 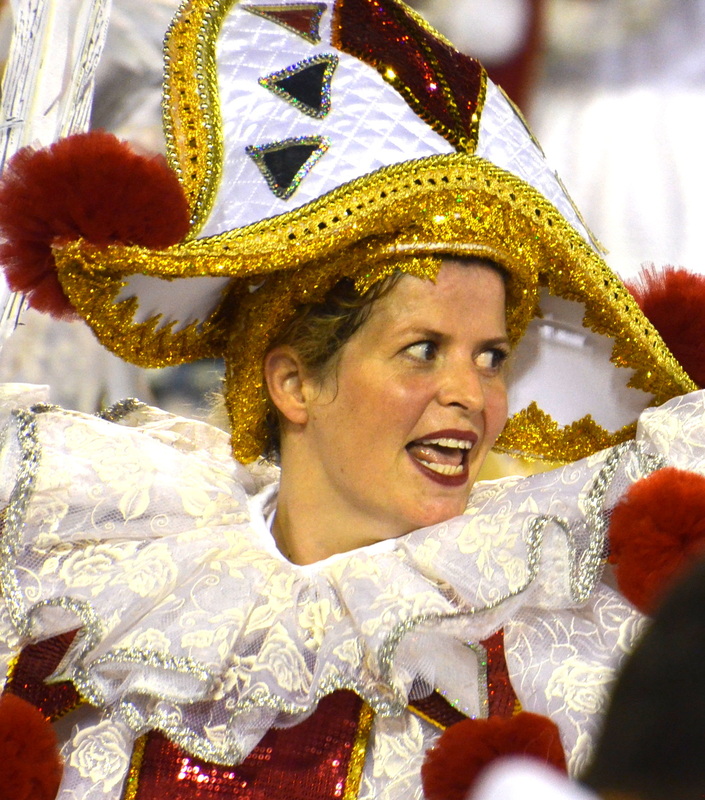 In addition, schools make money by selling the hundreds of costumes after the parade, and the schools require that parade participants buy their costume for the parade and attend practices at the school for about 2 months before the Carnival parade. 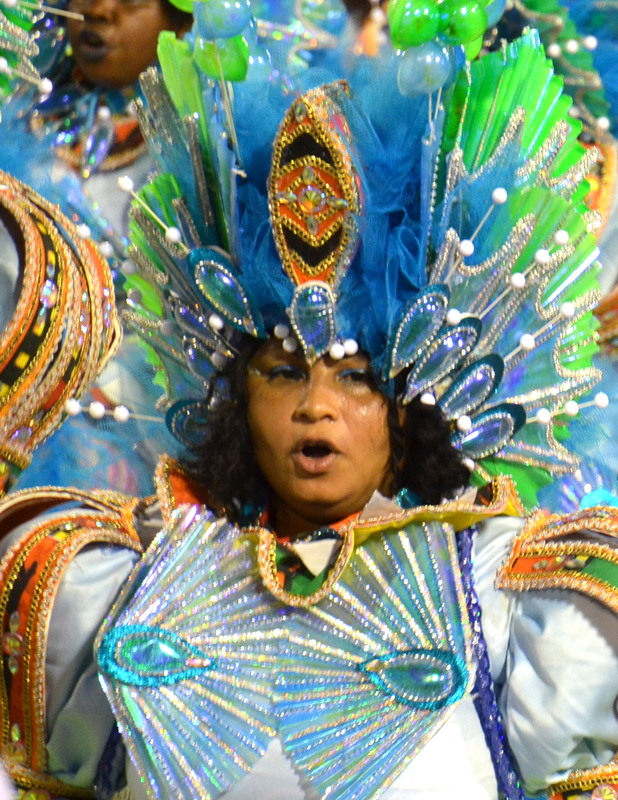 In those 2 months, costumes are made to fit each person, cosmetic professionals teach makeup to go with the costume and samba dancing is taught to go with the school’s original music. 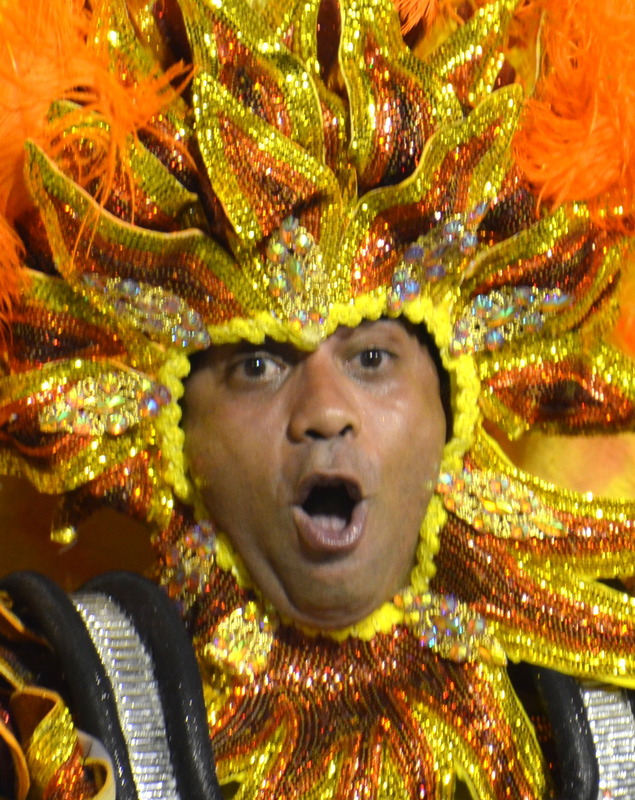 Cost of a costume is $300-$1000. per person per costume depending on the complexity of it. And a person can parade for more than one school. 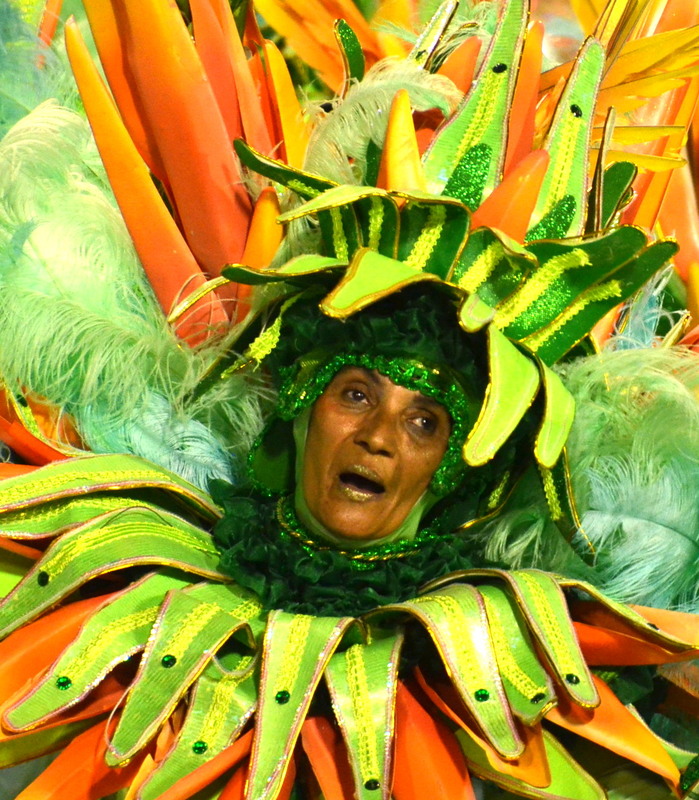 “Carnival is our passion in Rio and it is big business,” Sonia continued. 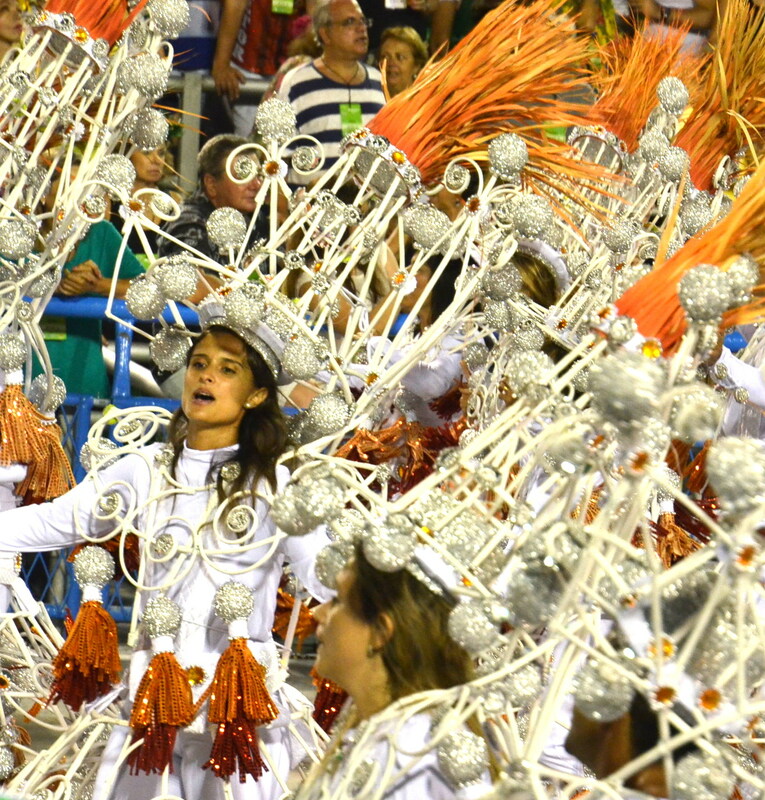 Each samba school has 1800-5000 participants, totaling 60,000 participants for 12 schools. 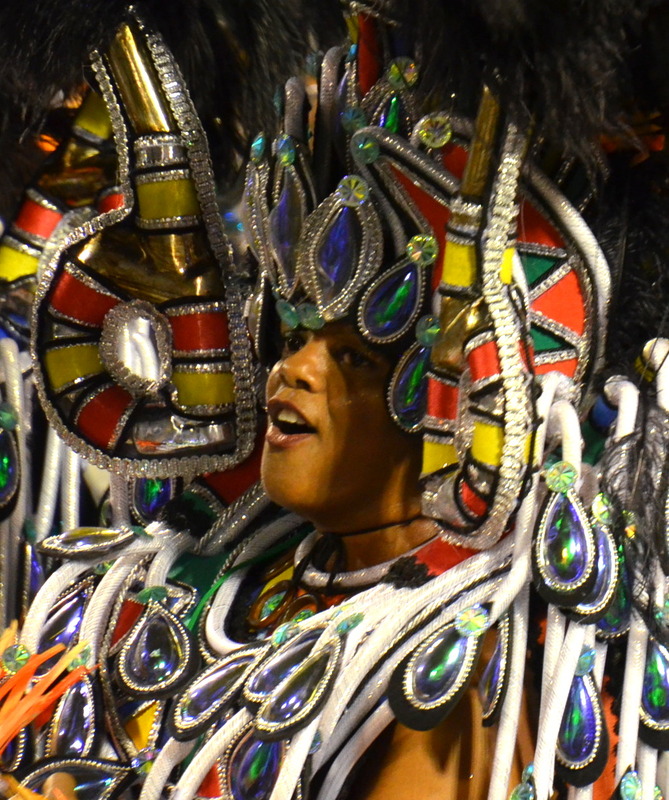 Plus, each samba school has 30 wing groups and can have a minimum of 6 floats and a maximum of 8 floats. 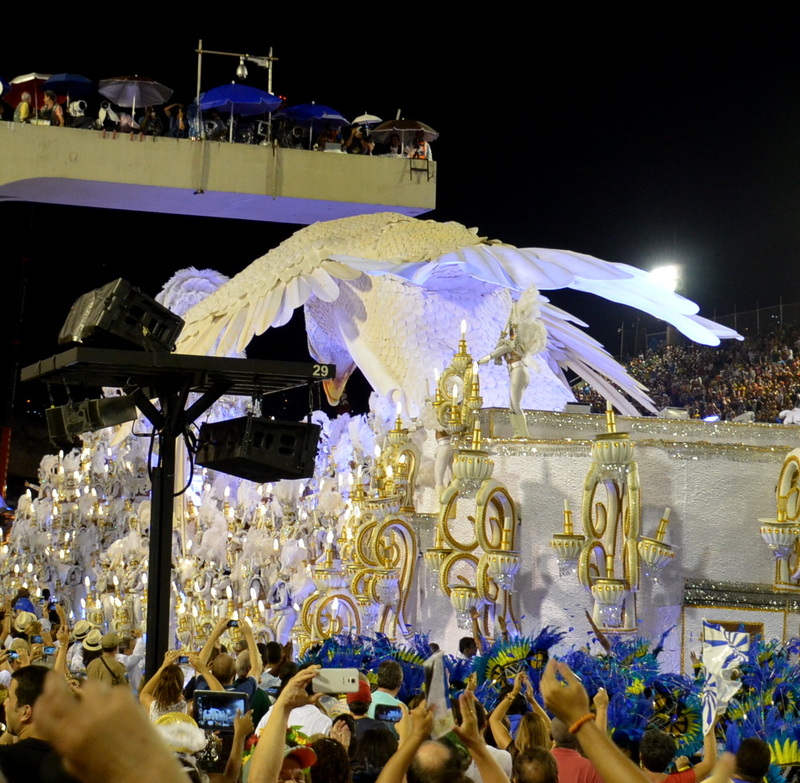 Each float can have up to 4 wing groups with over 100 people each accompanying it. 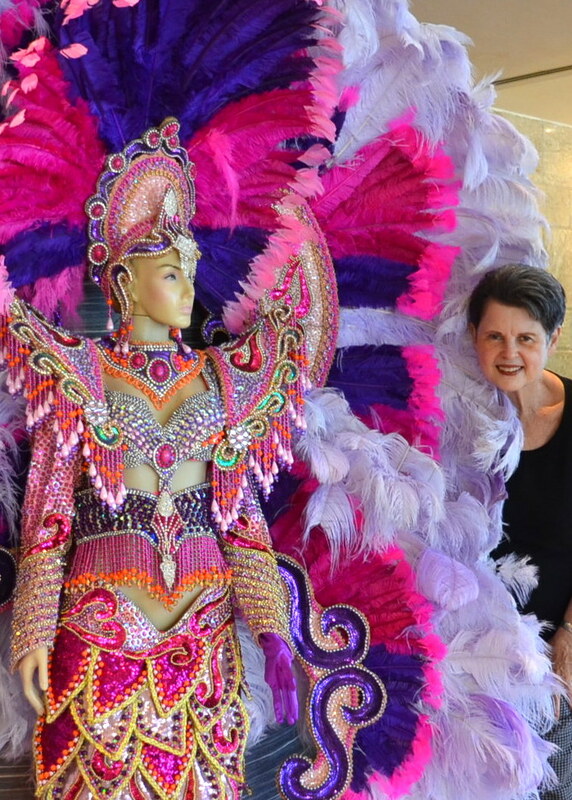 Each wing’s costumes and colors have to create an effect that leads right up to or be related to the float theme. 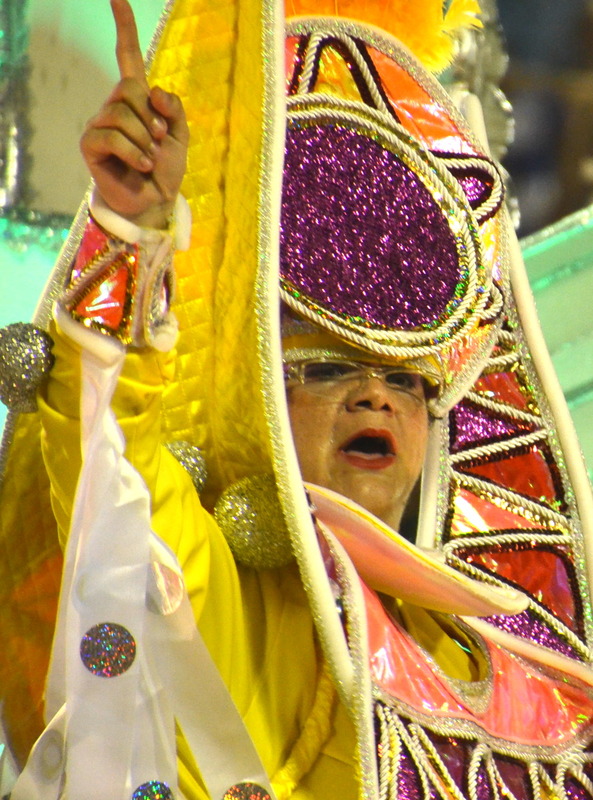 “Carnaval creates jobs for us,” Sonia said. 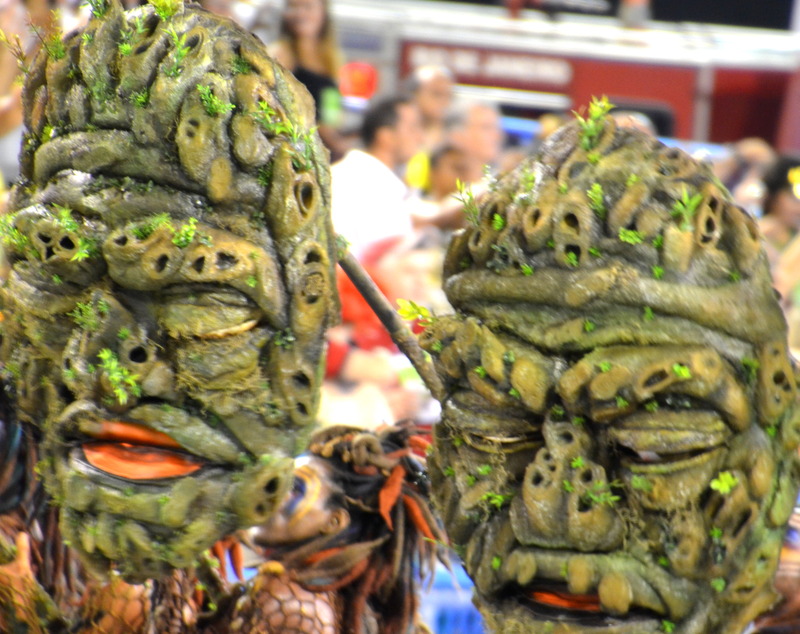 “To build these floats, and sew these costumes, schools hire several carpenters, painters, artists, sculptures, seamstresses and sewers, designers, business managers, bookkeepers, cleaning people, and others when a job needs to be done.” Many of the floats and costumes are being recycled, repurposed and redesigned into new floats, saving time, expense and materials. 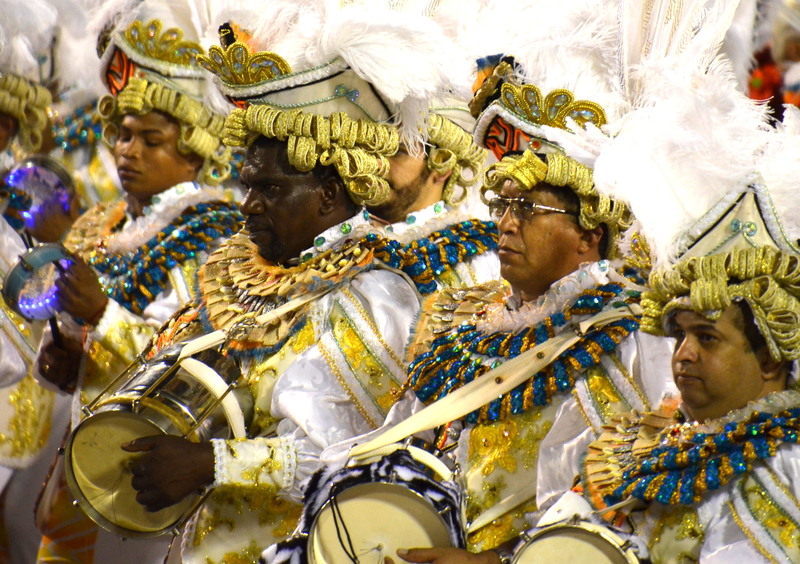 Five persons on top of each float keep the music beat going for 80 minutes nonstop by using hand signals telling the drum group how and when to beat the drums. 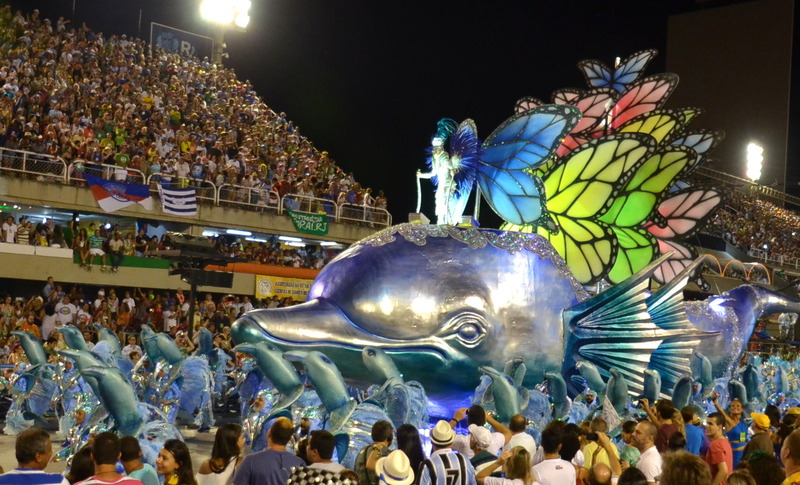 Each school is scored 5-10 points on each of the following items: the drum band, the samba song, harmony, theme of the year, flow and spirit (they lose points if they parade over 80 minutes), floats and props, costumes, flag carrying couple that leads the school, overall impression. 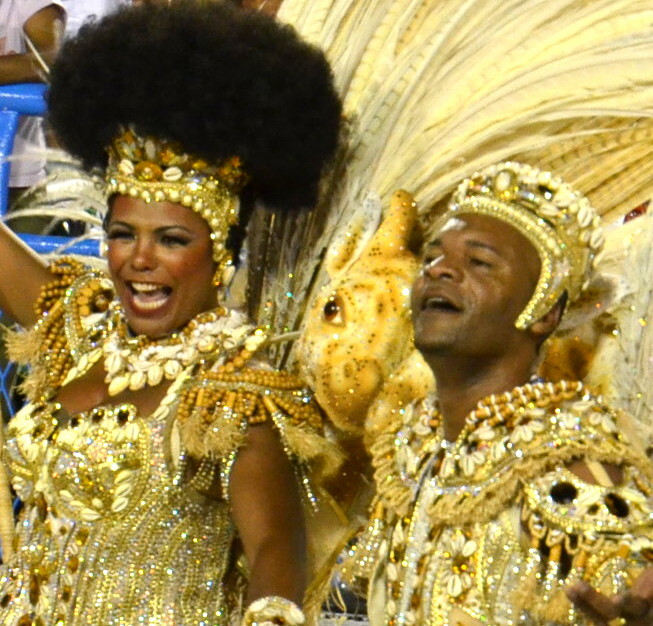 The samba school with the highest score wins the competition. Four judges score the same category for a total of 36 judges scattered along the parade route. 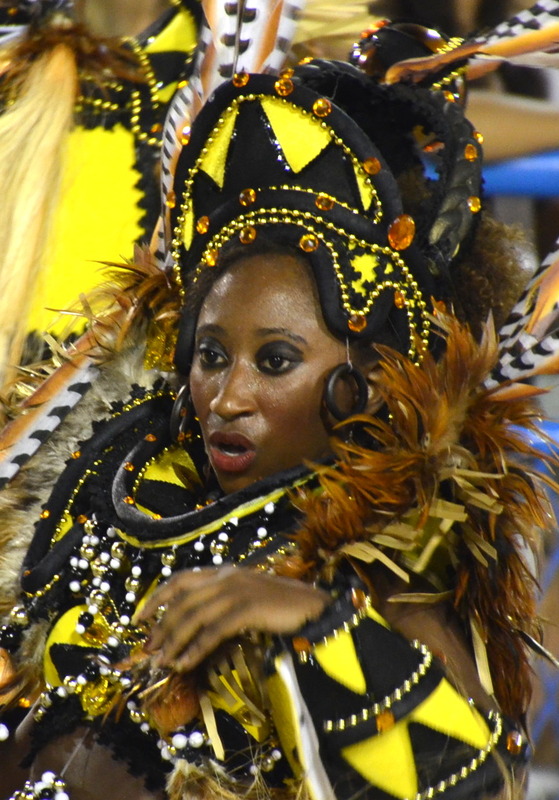 The six winners of the 12-school competition then go to the Parade of Champions held the following Saturday at the Sambadrome for their final performance. 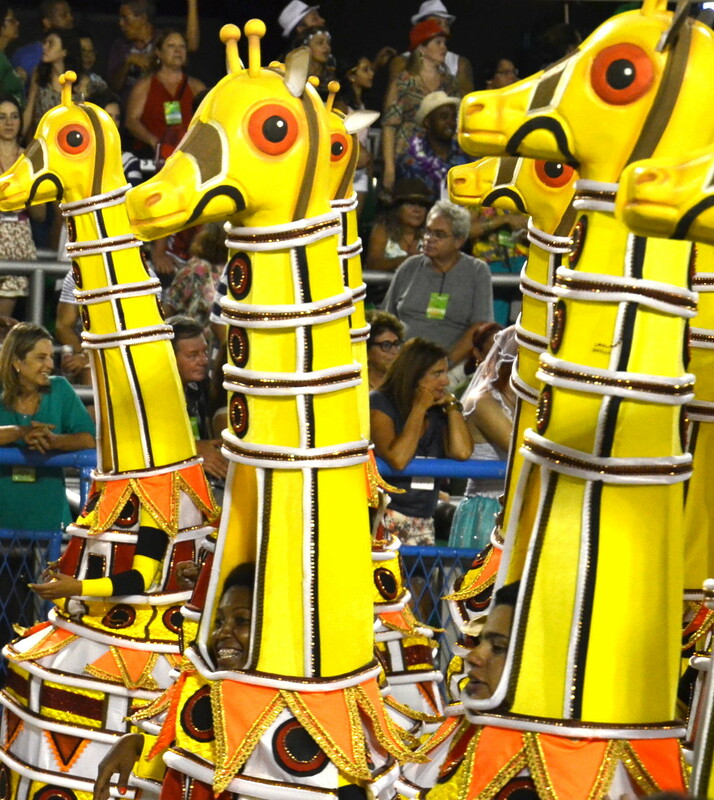 The 12 samba schools are: Viradouro, Mangueira, Mocidade, Vils Isabel, Salgueiro, Grande Rio, Sao Clemente, Portela, Beija-Flor, Uniao Da Ilha, Imperatriz and Unidos Da Tijuca. 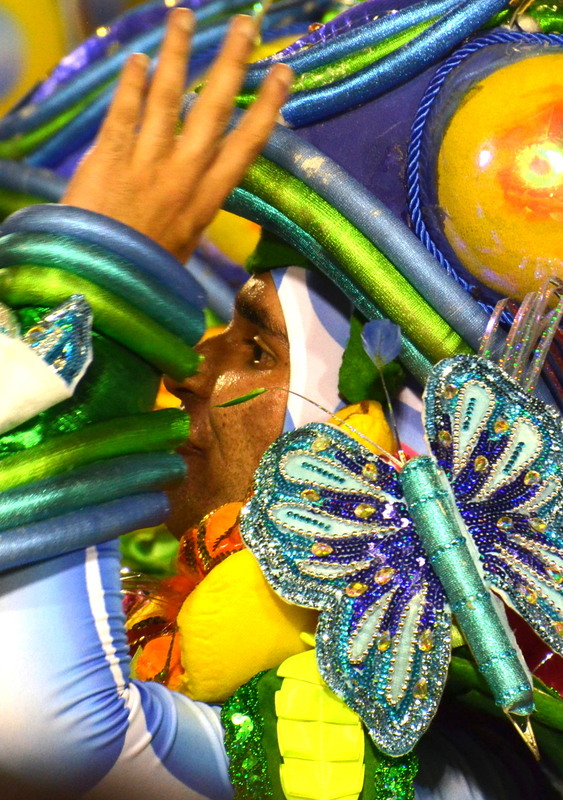 And the winner of the carnival we attended was Beija-Flor, meaning butterfly in Portuguese, the language of Brazil. 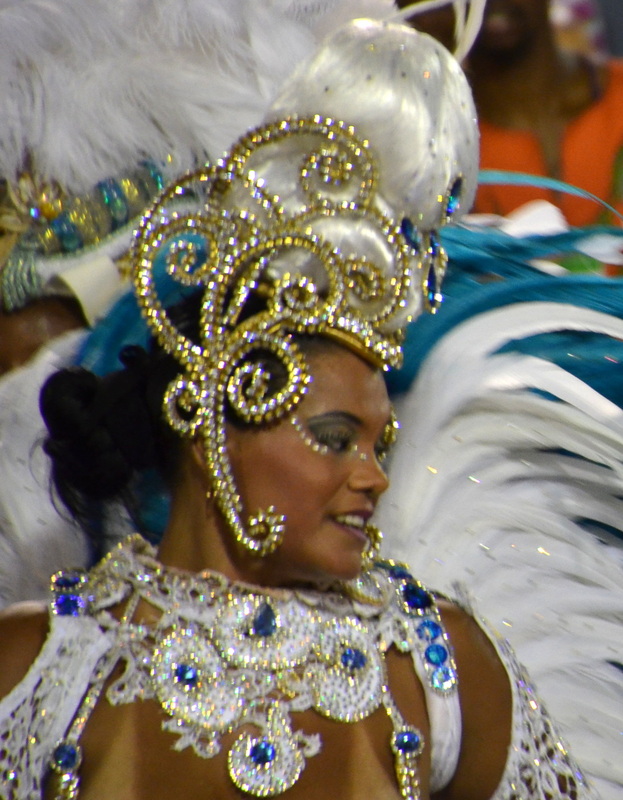 This was Beija-Flor’s 13th Carnival competition to win. 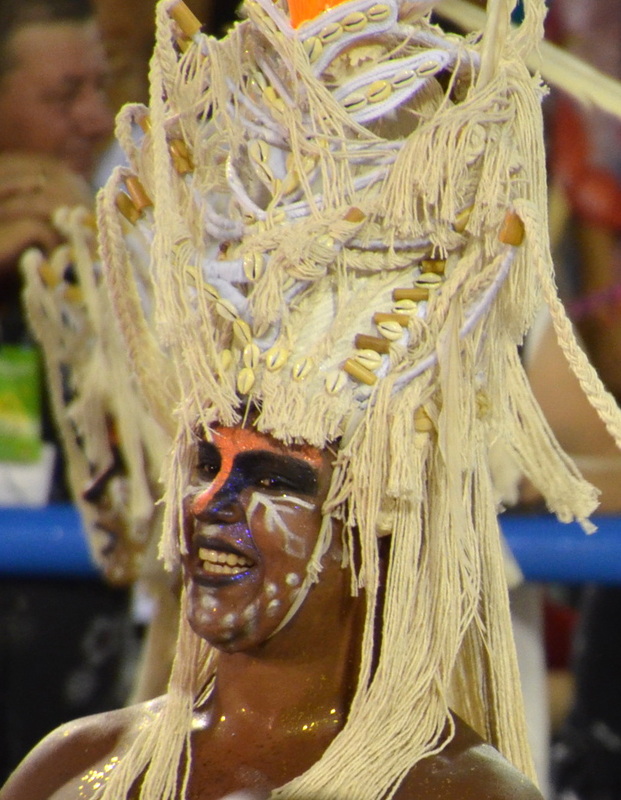 Their theme was Africa as the beginning of Carnaval in Rio originating from the slaves and this theme was shown over and over in everything the school did in music, costumes and floats. 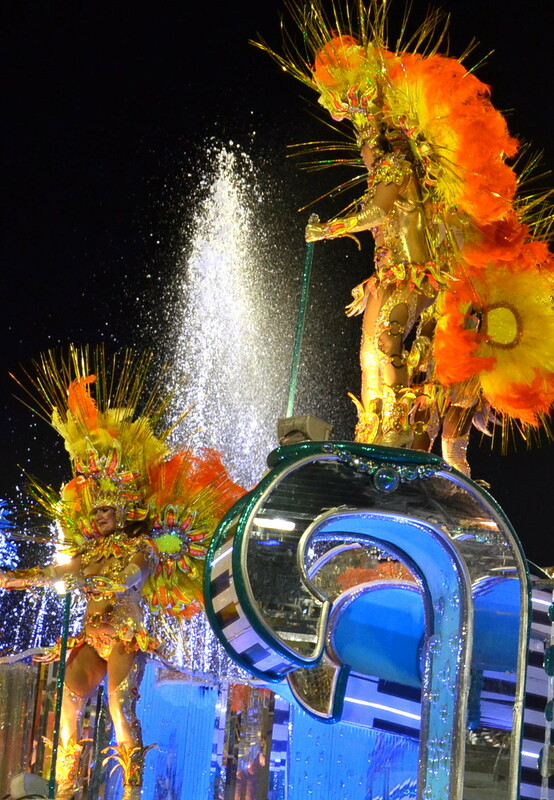 It was one wonderful night where you could be anything you wanted to be at Carnaval in Rio de Janeiro. 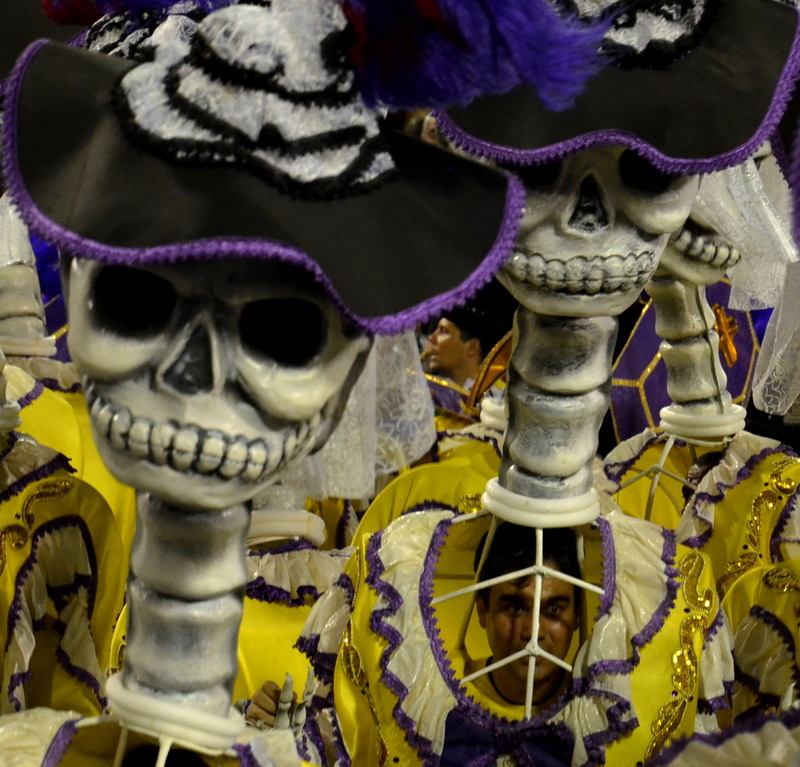 Huge masks on a pole operated by men covered in tight fitting netting. 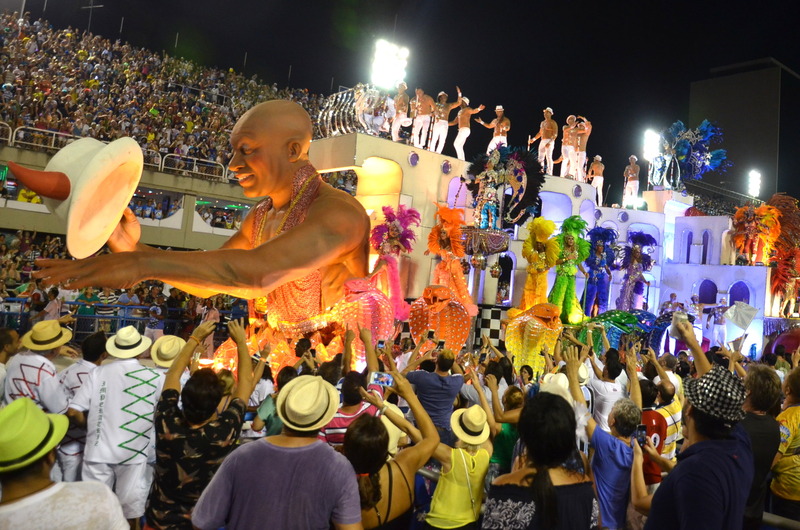 Men operating the huge masks in the parade. 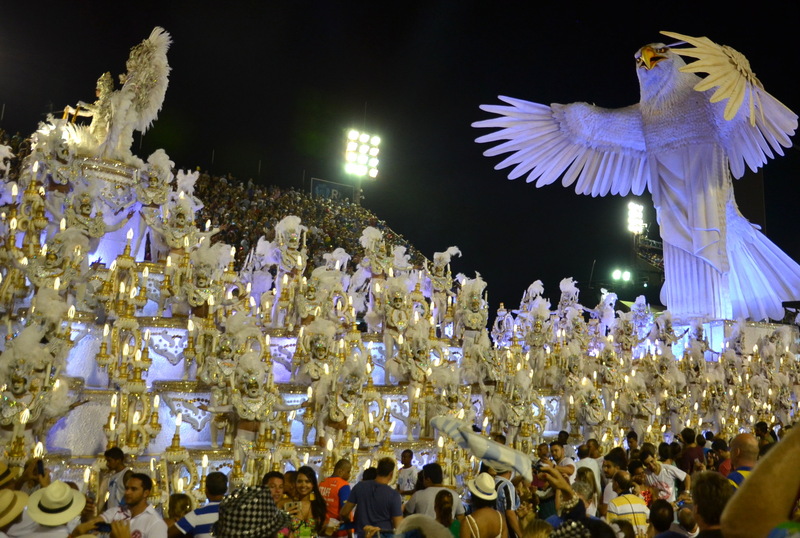 The Eagle is the mascot of the Portela Samba School. It was so tall, it had to bow to clear the news media tower. And when the Eagle bowed, the crowd went wild with screams of approval, After it cleared the tower, the Eagle rose again and the crowd went wild again.